Thanks for your interest in Troop 68. We’ve highlighted some key points below, but invite you to learn more by coming to one of our meeting; talking with our scouts and leaders; or stop back here at www.edinatroop68.com. We meet Monday’s from 7-8:30pm at Good Samaritan United Methodist church in Edina (except for the first Monday of every month, when our adult and scout leaders meet). Each meeting is scout planned and led, and typical activities include camp out prep, working on merit badges or advancement skills, or sometimes just having fun playing games. Many of us also belong to sports teams, band, and other groups.That’s OK. No one expects you to make every meeting. While we do lots of different activities throughout the year, our favorite is camping, and we have a camp out almost every month for troop members who are interested and available, scouts and parents alike. In the last few years, we’ve been to Glacier National Park, Florida Sea Base, biking in Lanesboro, hiking and fishing on the North Shore, Summit Bechtel Reserve in West Virginia, and many great camps and parks throughout Minnesota. The troop just finished their involvement in the Eagle Scout Project for Brendan Will for building a new landscape wall around the fenced in playground at Good Samaritan United Methodist church. What camps are coming in 2015? 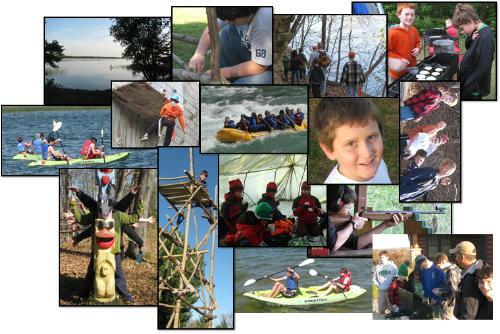 By far our troop's biggest troop outing each year is This camp provides scouts the opportunity to enjoy a full week of swimming, archery, canoeing, shooting sports, hiking, cooking outdoors, and a whole host of other fun outdoor activities. Because of the well organized programs provided at Many Point, the camp provides the best opportunity of the year for the boys to earn 4+ merit badges in just one week providing a big boost for their rank advancement. Planning is underway... a likely October outing to the Fred C. Anderson Scout Camp in Wisconsin for a weekend stay in the big troop cabin. Ice fishing in January; Welch Village weekend ski trip in February, Fort Ripley Rendevous in May, Lanesboro biking campout in May, Rum River canoeing in June, Learn more and see pictures at our web site. We are fortunate to have many involved adults, with lots of registered leaders and adult Eagle Scouts, including our Scoutmaster, Mr. Vanderbilt. Parents are invited (but not required) to attend all meetings, and encouraged to help out, whether that’s a more active leadership role, or just helping out occasionally on a camp out or at an event. We have a great group of parents active at many different levels, and invite your parents to talk with one of our adult leaders about how our troop might work for them. We have a Pancake Breakfast in March and Wreath Sale in November. Scouts earn 30% of their sales as scrip to use to cover camping or activity costs. Service to others is a part of scouting, so we do activities like helping around Good Sam’s, Scouting for Food, Fort Snelling Cemetery clean up, Feed My Starving Children, and assisting with Eagle projects such as clothing drives, and park restorations within our community. Founded in 1966, Troop 68 is chartered by Good Sam’s. We currently have about 32 registered Scouts, and have historically averaged between 30-55 scouts. We have graduated over 120 Eagle Scouts, and currently have multiple Life Scouts working towards the Eagle Scout rank. Boy Scouts offers over 120 merit badges, where you can learn new skills or develop an existing one, from woodcarving to electronics to rifle shooting.We also help new Scouts work toward First Class rank as soon as possible.Then, each scout decides how far—and fast—he wants to advance. Some work hard toward becoming an Eagle Scout. Others slow down and simply enjoy having fun and participating in our camping trips. Whatever works for you. There are also leadership growth opportunities for those who are interested, such as Grey Wolf Junior Leadership Training.